Ridgehaven is a 30-bed nursing home in Monto, a small farming community 500km north of Brisbane, Queensland. The facility recently had a wonderful idea to hold a Seniors Graduation Ball, where residents graduated with honorary titles specially selected to boost self-esteem and rekindle their spark. Much preparation went into the event with a team of h airdressers and make-up artists creating a flurry of special hairstyles and glamorous looks. Special effort went into finding special outfits and wonderful variety of formal outfits was created. 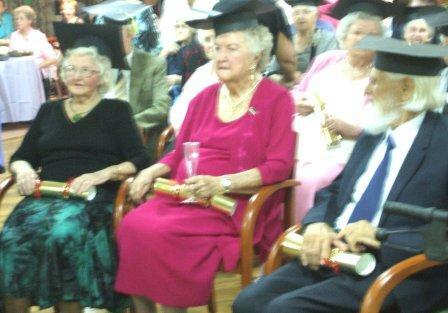 Residents also enjoyed making mortarboards for the ceremony that featured wonderful gold tassels. A crowd of over 160 friends, family, and residents attended the night and several staff members also received acknowledgement for their recent training achievements. Residents ‘graduated’ in special categories including May for ‘Helping Others’, Ivor for ‘Positive Ageing’ and Audrey for ‘Giggles’. The creativity of the awards celebrated everyone for their own unique attributes and were specially selected to rekindle their spark of life. Graduates were officially presented to the local Mayor to receive their hand-made mortarboards and an award of a giant golden cracker. 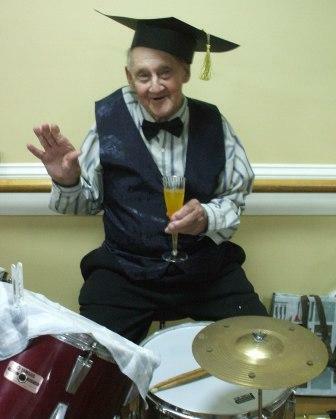 The celebrations continued with dancing to the Ridgehaven Band that features 90-year-old resident Bill on the drums. Students from the local high school were keen to be involved and helped serve a delicious supper made by the Ridgehaven kitchen staff. The event was a great success and there were many requests for more dances in the future. Ridgehaven is a great example of how a facility can celebrate residents for their own unique successes. What a fantastic way to boost self-esteem for every person with dementia. It is clear that Ridgehaven’s Graduation Ceremony rekindled the Spark of Life! A special thank you to Annette from Ridgehaven for sharing this story.